Twin Cities Wine Education is proud to present a night of music, dancing, bubbles, and french fries! GastroVINO: Bubbly and Fries 2019! Presented in partnership by Twin Cities Wine Education, Solo Vino Wine Shop. and Black Dog Lowertown. During the sparkling wine and Champagne masterclasses of December, I made one thing perfectly clear: the best food pairing with a glass of bubbly is anything deep fried and salty. And what is the ultimate deep fried and salty food? French fries, of course. Really, really, really good hand cut french fries. Join us on Sunday, March 10th to prove it! Enjoy live music while a wide variety of sparkling wine is poured for you and basket upon basket of fries magically appear from the kitchen of Black Dog Lowertown. Is this a wine class? Not really, though you will learn a ton and have access to a wide variety of wines. Is this a great reason to have a good time? That’s more like it. It’s also a way to discover which sparkling wine goes best with fried spuds. Over a dozen sparkling wines from around the world will be chosen for the night including prosecco, cava, Trentodoc, American sparkling wine, southern hemisphere sparkling wine, and more. You are free to enjoy them all while grabbing french fries whenever the mood strikes you. The event begins at 6:00 pm and goes until 8:00. You’re encouraged to stick around afterward for dinner at Black Dog Cafe while enjoying the atmosphere and more beverages of your choice. Tickets are limited, first come first served. Must be 21 to purchase. Note: Tickets are non-refundable, but are transferable. 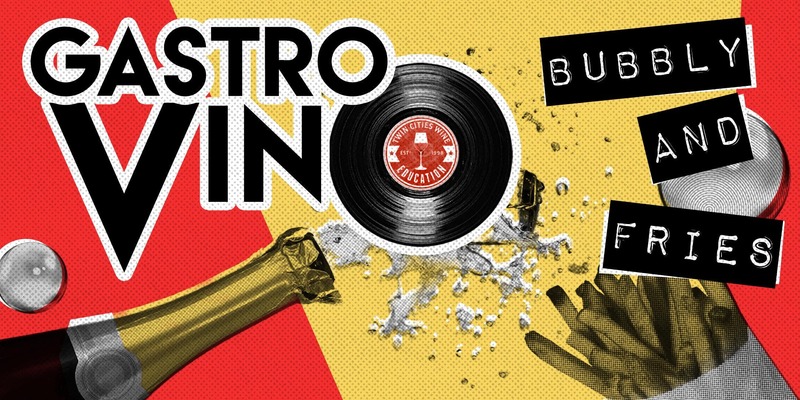 We hope you can join us for GastroVINO: Bubbly and Fries 2019! Please consider a rideshare service (Lyft or Uber) for transportation.